What a day. Got soaked going to class today, so I was freezing. Turned the heater way up when I got home to compensate. Still working on Rex the main character. I think his proportions are looking a bit better, but I am having problems with his head. Working on him, he keeps looking a bit like a hippo rather than a Triceratops. I suspect they probably to look a little similar. Since I haven’t added Rex’s ‘frilly’ neck part yet. Maybe he will start looking a bit different when I add that. I’ve moved his front horn a little further up his snout, away from the end, I think this helped a little. I suspect a bit of texture to make his horns look a different colour to his body would help as well, but I’m not ready to even look at textures yet, maybe I should just give him a quick disposable poly-paint or something. Thought I would post him either way. Most of the work is still being done is Zbrush, but I had problems with him not being aligned correctly, so I exported his model to Maya to align him with the axis, and then back to Zbrush, so I took this quick render from Maya. Well I have a very basic story as posted already. I am currently working on making the models. I’m not sure if I really like modeling, I have never been good at drawing or the like. I will look at two objects, but not really be able to tell the difference, so first I wiped up a quick model of what I think Rex may look like. 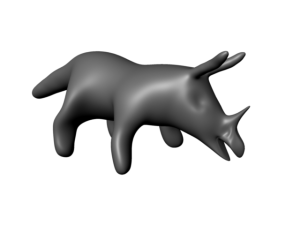 I am using a basic of a Triceratops, but that doesn’t actually mean that this is what Rex will be or behave like. 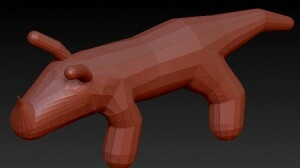 The first model was made using Zsperes in Zbrush. Apart from the nose, it kind of what I had in mind. The ‘frilly’ part around the neck that the triceratops has I plan to add latter with some sculpting. Personally I was looking at my various reference photos, and looking at Rex above, and I though, yes, time to get onto the next step, but I’m afraid I was told I’m wrong. Poor wee Rex is going to need a lot more modeling before the instructor is going to tell me what is next in my work-flow. I need to beef him up a little, work on his proportions, and a lot of other stuff. 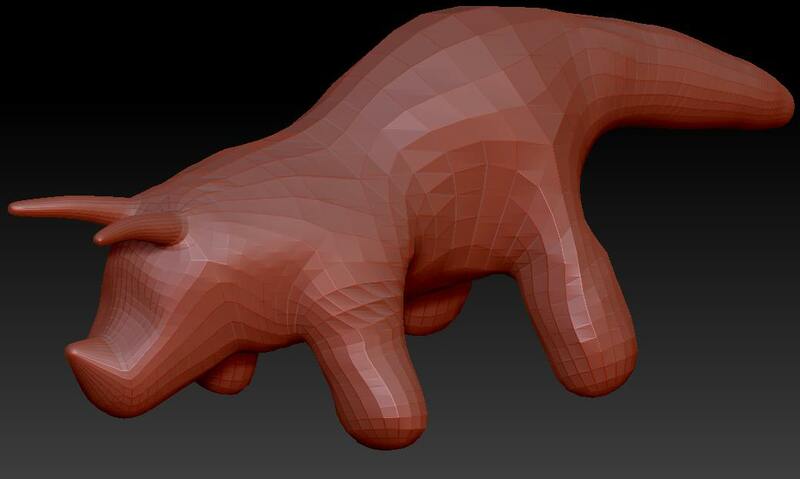 I have started working on these things now, though I’m not sure how much progress I am making, as I said, drawing, knowing what needs working on, etc., isn’t (currently) my strong point, so back to Zbrush, and a little (lot?) more work needed.